The Lovers Leap Trail Custer State Park provides scenic views of the surrounding Black Hills, but is a difficult 3-mile loop trail. The trailhead is located behind the old schoolhouse, which is across from the Peter Norbeck Visitor Center on Highway 16A. From the trailhead, there is a steep ascent to the ridge behind the State Game Lodge. At the highest point, there is a rocky outcropping named Lovers Leap. Legend has it that two Native American lovers once leaped to their deaths from this point. From the high vantage point along the ridge, Harney Peak, Mount Coolidge and the Cathedral Spires can all be viewed. Also within view is the area that fell victim to the Galena Fire of 1988. The trail descends from the ridge and crosses a creek several times, which can be challenging with no bridges. Fallen trees and rocks provide some footing to scamper across the creek when the water levels are low. 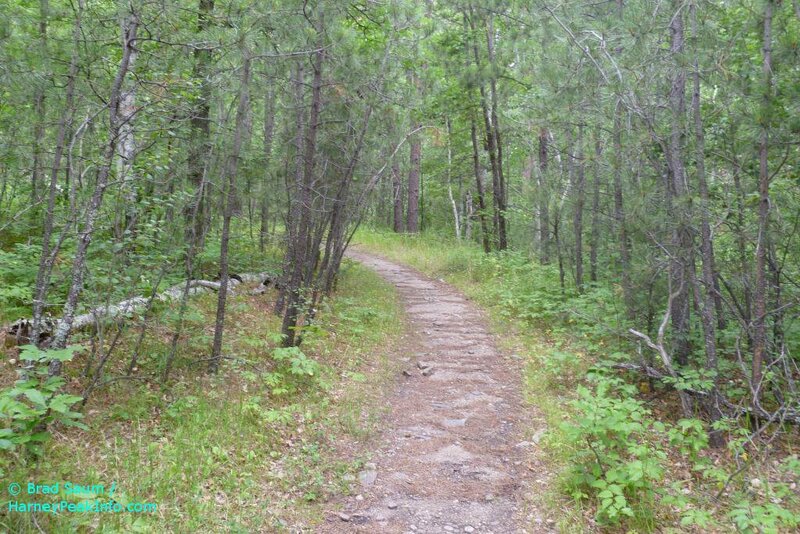 The final portion of the trail follows a road to the Coolidge General Store, and the there is a footpath along 16A that leads past the chapel and back to the trailhead.